The National Nursing Network Organization Board of Directors is proud to announce the support of the Care Continuum Alliance for HR 3679, The National Nurse Act of 2011. This represents a significant endorsement for this legislation, as the Care Continuum Alliance represents over 200 corporate and individual stakeholders—wellness and prevention providers; disease and care management organizations; pharmaceutical manufacturers; pharmacy benefits managers; health information technology innovators; biotechnology companies; employers; physicians, nurses and other health care professionals; and researchers and academics. 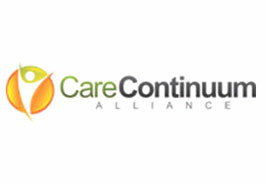 An important mission of the Care Continuum Alliance is emphasizing the importance of both healthful behaviors and evidence-based care in preventing and managing chronic conditions. This is perfectly aligned with HR 3679, The National Nurse Act of 2011. There are now 100 prominent individuals and organizations have endorsed HR 3679, The National Nurse Act of 2011. To view the most current list, click here . For more information about becoming an endorser of this important legislation please email the NNNO Board . The National Nursing Network Organization thanks the National Association of Hispanic Nurses (NAHN) for sending this letter in support of HR 3679, National Nurse Act of 2011 to Congressman Charles Gonzalez (TX-20) who chairs the Hispanic Congressional Caucus. The National Association of Hispanic Nurses (NAHN) prides itself to be a professional nursing organization representing thousands of Latino nurses residing in the United States and Puerto Rico. NAHN is committed to advancing the health of Hispanic communities and advocating for policy changes and perspectives that accomplish this goal. It is for these reasons that NAHN is proud to announce its support for HR 3679, National Nurse Act of 2011 . HR 3679, introduced by Congresswoman Eddie Bernice Johnson (D-TX) and co-led by Congressman Peter King (R-NY) ) designates the Chief Nurse Officer of the USPHS to be known as the National Nurse for Public Health. This legislation will significantly promote public health and help to address costly health disparities in our country. The National Nurse for Public Health would provide a visible nurse leader to advocate for enhanced prevention efforts for all communities. Further, NAHN recognizes the value of having a National Nurse at the federal policy table, meeting with health care leaders to highlight health disparities, bring forward new ideas, and promote evidence-based interventions. Chronic, preventable conditions have costly consequences both in health care dollars and morbidity and are especially prevalent in our nation's under-served communities. During this time of economic uncertainty, now more than ever, nurses must continue to be proactive in the fight against illness and disease. HR 3679 helps to keep nursing in the forefront by asking the National Nurse for Public Health to be a visible presence and work to engage nurses and health professionals to replicate successful health promotion programs in their local neighborhoods. NAHN strongly endorses establishment of a National Nurse for Public Health because we believe that nurses, as the largest and most trusted sector of the healthcare sector, are well positioned to make important strides in keeping the Americans well. We hope the Hispanic Congressional Caucus concurs and will do all it can to help secure the passage of this bill. 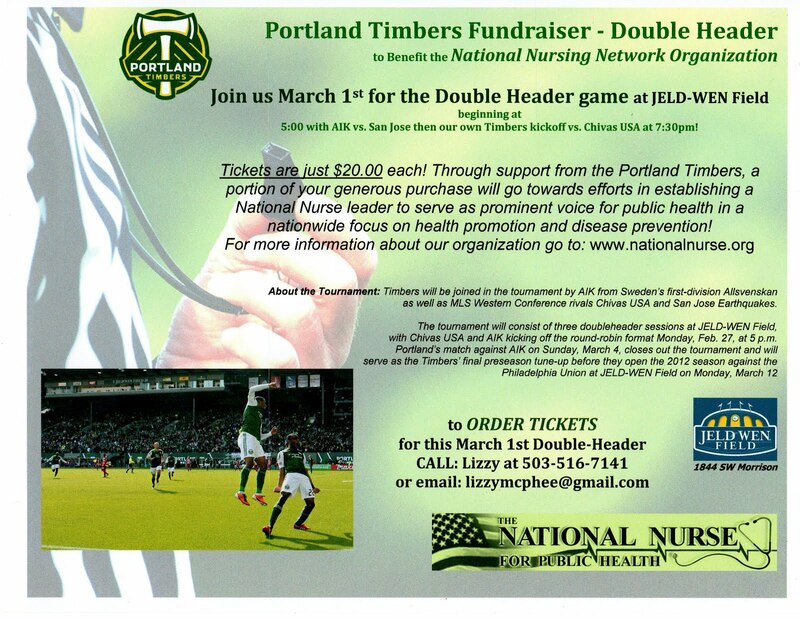 Portland’s Major League Soccer team, The Timbers, are teaming up with the National Nursing Network Organization! 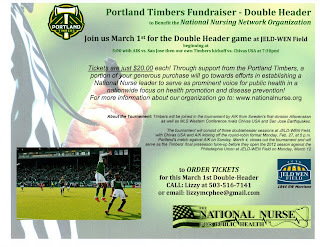 Join us March 1st for the Double Header game beginning at 5:00 p.m. with AIK vs. San Jose, then Portland's Timbers kickoff vs. Chivas USA at 7:30 pm. The Portland Timbers have generously donated a section of 106 seats and are contributing $8.00 of each ticket sale to the NNNO to support our important campaign. Timbers games are one of the hottest tickets in Portland right now and each soccer game is always sold out! As a matter of fact those who want Season Ticket packages are currently on a wait list! Be among the first to experience the newly remodeled JELD-WEN Field. It has the reputation of being one of the most intimate, exciting, and authentic soccer facility in the United States. Tickets are $20 each-- there is no service charge. Email Lizzy McPhee to purchase your ticket now! We are deeply appreciative to the Timbers for their generosity.